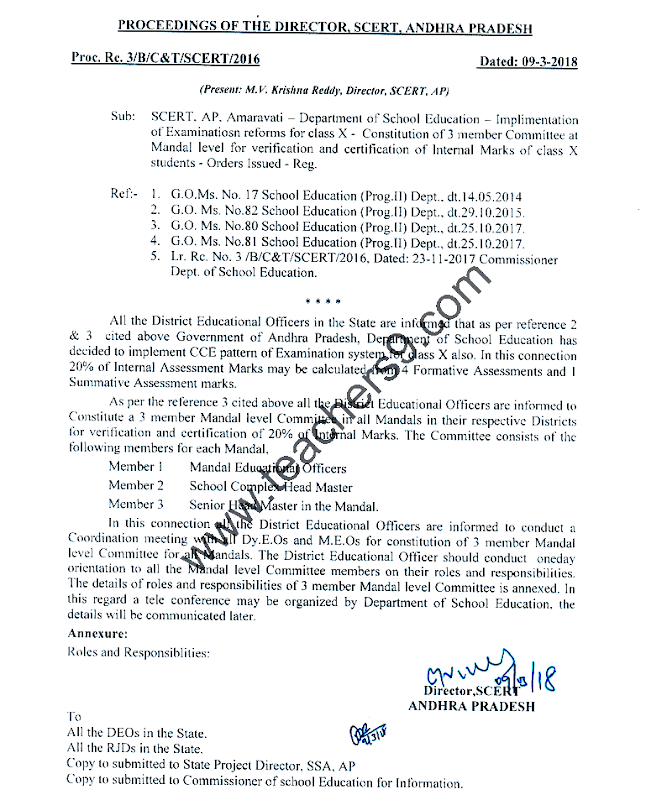 As per R C No 3, All the District Educational Officers in the State are informed that as per reference 2 & 3 cited above Government of Andhra Pradesh. Department of School Education has decided to implement CCE pattern of Examination system for class X also. In this connection 20% of Internal Assessment Marks may be calculated from 4 Formative Assessments and 1 Summative Assessment marks. As per the reference 3 cited above all the District Educational Officers are informed to Constitute a 3 member Mandal level Committee in all Mandals in their respective Districts for verification and certification of 20% of Internal Marks. The Committee consists of the following members for each Mandal. Member 3 Senior Head Master in the Mandal. Prepare verification of 20% Internal Marks scheduled based on number of schools in the Mandal. Observe the process followed in conduct of Formative and Summative Assessments in class X Formative Assessment notebooks which contains student reflections, return works. Project reports should be verified, whether the four formatives conducted and upload the marks in the website or not. Ask the Head Master to login in CSE website with their personal login ID and verify students marks. Observe validated SA-1 answer scripts and marks allotment with School Registers, online information. After verification of all the records relating to FA. SA marks entry and 20% marks calculation, 3 man Committee should issue a certificate of verification to the School Head Master. The same copy should submit to concern Dy.E.O.